I’m taking a break from my regularly-scheduled programming to bring you this editorial about my “Divide and Conquer” philosophy. I hope you’ll find it helpful during this time of seasonal surplus. Is it just me or do you also have trouble resisting leftover desserts from holiday celebrations? With Thanksgiving behind me, but hopefully not still ON my behind, I am contemplating my plan of defense against the traditional weight gain of the Christmas season. For me, the leftover pie, cake or cookies beckon most loudly when everybody has gone home. Of course, I try to pawn off any extra food, but I’ve observed that more and more, people decline. And who can blame them? After accidentally buying several 7-1/2 inch glass pie plates on Ebay a few years ago, I noticed the average pie recipe, when cut in half would fit perfectly into my small pie plates. Although reduced in size, there still seemed to be plenty of dessert for our special family dinners (hubby, me, 2 sons and their wives and kids) with few to no leftovers. So, I started looking around. I found a small tart pan at a Home Goods store; small, round, cake pans (6-inch) at a restaurant supply (also seen in craft stores); and a small bundt pan in my mom’s kitchen. I even have a spring-form pan in a small size as well as small loaf pans. This means I can cut almost any dessert recipe in half. Everybody gets to enjoy his sweets, but I don’t have much left when the party is over. One of my favorite ways to downsize dessert servings is to use these mini-tart silicone molds. 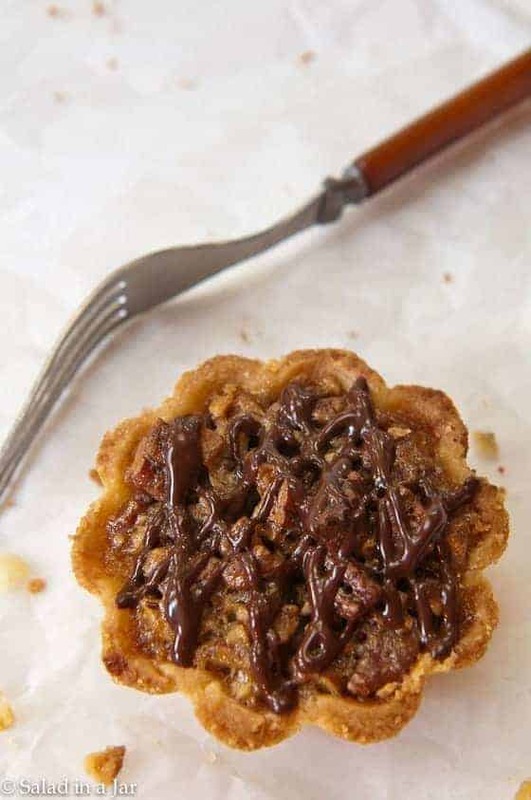 as seen in the Pumpkin Pie Mini-Tarts and the Browned Butter Pecan Mini Tarts below. 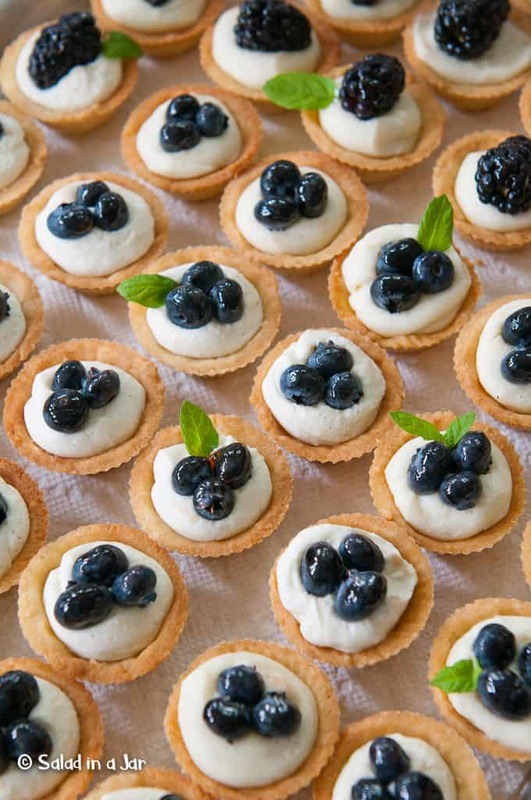 These molds that are even smaller as seen in Mascarpone Cheesecake Mini-Tarts below right. They are the perfect size to eat out of hand. Also good for people who want to try several different desserts. Last week, for Thanksgiving dinner, I made 4 (7-1/2 inch) pies, all of them filled with only half a recipe. Multiple culinary choices seem to be part of the Thanksgiving tradition and I wanted to make sure everybody got what they wanted without too much waste. Most people took a taste of several different pies, then helped themselves to a larger serving of their favorite one. The result was much fewer leftovers than past years when we would have 4 or 5 full-size pies. In fact, so few that I didn’t feel guilty about tossing remainders at the end of the day. I remind myself that anything in short supply suddenly seems more precious and popular. Better to have people fighting over the last piece than trying to pawn off half a cake on people who really don’t want it or worse, me eating it later. After all, we’re talking about dessert here. Nobody really NEEDS it. Try experimenting ahead of time with any particular recipe you’re planning to divide to make sure you did the math right. I make note of the amounts for future reference right there in the cookbook. For things like pie or tart crusts, you may need more like 2/3 or 3/4 of a recipe. I like to double a one-pie-crust recipe and then make 3 smaller crusts instead of 2 larger ones. The same rule applies to frosting. Don’t forget to adjust baking times. A half-recipe will likely take more than half the original time but not quite as long as a whole recipe. This may be a duplicate request. It disappeared after I tried to send. Do you remember Ell’s breakfast Slices. I loved them and they just disappeared off the shelves probably 25-30 years ago. They were wonderful. Better than Hawaiian bread. I wish you could replicate. The slices were dense and yellow colored. As a former Home ec person, wondered what your take is on buying a good yet inexpensive pan. Do not want the nonstick, yet I havent a clue as to what to buy. Sona, I use a Scan Pan skillet. It has a titanium non-stick finish. Sorry, except for my Le Creuset, I use nonstick because I don’t like to use much oil in the pan. I also don’t like to scrub pans. My favorite cookie sheet is a Volrath. Love, love them. Available at restaurant suppy or online. What a fantastic idea!!! My husband is always joking that I make enough food to feed a small army… it’s just the two of us, but growing up I frequently cooked/baked for a large family. Old habits die hard. Being forced to prepare smaller servings will definitely be helpful for me. Anyway. I’m a newcomer to your website…. I followed a pin on pinterest for your salad in a jar (which is equally brilliant). Glad to have found you! You are brilliant! I like to make small tarts/quiches, but I should do it for dinner parties too. Everyone usually has too much dinner and eats little, or no, dessert. This way I don’t have to eyeball the dessert when I am pouring my morning coffee. This is such sensible advice– thank you! Today I will be throwing away the remains of the last 2 bakery pies that others brought (not worth eating). 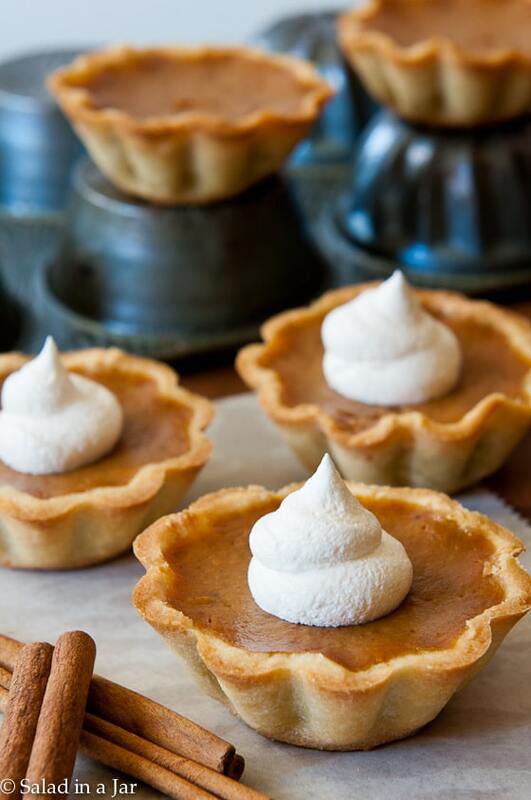 Next year I’ll make the pies–minis!. You always have great ideas, Paula! I love these smaller pans, didn’t know they came in all these different varieties – I do love Homegoods too – seems like you can always find such fun things there! Another thought is to make two pies or cakes in the smaller size pans and freeze the other portion for the next party or get together – giving you less leftovers but also less work when the next special occasion rolls around! Chris, Great idea–especially for cakes and pie crusts. This is a great idea. 🙂 None of us here need leftovers to tempt us. 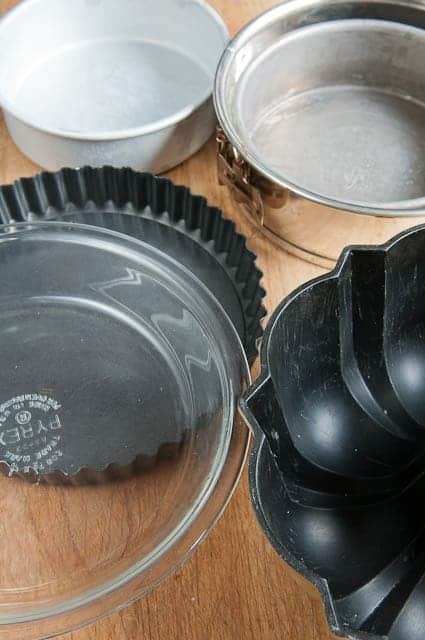 I have several smaller sized cake pans, but no small pie tins. Those I’ll have to look for! I have a suggestion when baking anything on a thin cookie sheet ,such as dinner rolls. I put two cookie sheets together and this prevents the bottoms from getting too brown while the tops turn out beautifully brown. Such smart advice Paula, I only made one pie this year and the rest people brought so it’s gone and by the way it was your recipe for Banana Cream Pie and it turned out fabulously delicious! I’m off to the gym now only my 2nd day for the week at the gym but one day at home so not too bad for a holiday week with out of town guests. Hope your hand pies turn out great. Enjoy the rest of the weekend. Great idea! I just found the small sizes on http://www.foodservicewarehouse.com. They’re advertising no minimum order for this week only and free shipping. Thanks for the great tip! Thanks for leaving the link Marilee. They have all kinds of cool stuff. I could go crazy!